You are here: Blog / Free Stuff / Let The 420 Fiesta Begin: April Vaporizer Giveaways! Let The 420 Fiesta Begin: April Vaporizer Giveaways! While that overgrown rabbit hides eggs all over the place for seemingly no reason EZVapes is giving away free vaporizers to some lucky followers and fans all month long! Spring has officially sprung and that means it is time for everyone’s favorite holiday, 420! How time flies, but it is that time again to pull out all the stops, give away some amazing vaporizers, and bask in the glory of the best counter culture celebration there is. We’ve got 4 weeks of vape giveaways lined up,each Friday as per usual, but you know we had to step it up just a bit for the holiday, so just take a gander at what we have in store this month and try not to drool on yourself please (it’s a bad look). It is time to clock in, because the boss needs to speak with you, the Atmos Boss that is. Atmos outdid themselves with this beast, its stainless steel heating chamber was specifically designed for dry herbs, instead of being a secondary concern like with most other so-called “dry herb” vape pens currently on the market. It is the thinnest we’ve seen yet to produce real vapor without combustion and is the ONLY true dry herb pen vaporizer on the market, in that the cartridge and battery disassemble, allowing either part to be replaced individually. Out of all the brands we gave out vapes for in last year’s April giveaways eDab is the ONLY one to make a return. Why is that you ask? The customer gets what the customer wants, and when it comes to concentrate pens we know you want the quality, style, and efficiency eDab is fast becoming known for! Unlike other brands in its class, eDab doesn’t just “throw s*#% against the wall” to see what sticks. Their products were designed by users for users, which results in a difference you can see and feel. The HELOS-G Case Kit combines a sleek variable voltage eDab Spin battery for precision vapor output with the refined look and rugged craftsmanship of their proprietary durable borosilicate glass globe, designed for fresh taste and maximum airflow. Everything else you could possibly need is included in this kit: extra coils, stainless hand tool, USB charger, and lightweight carrying case. eDab has created a nearly perfect dedicated set up to enjoy your favorite waxy oils and concentrates anywhere, anytime. No, it isn’t déjà vu you are experiencing, Atmos makes a triumphant return from week 1 to bring yet another amazing vape pen-ish sized handheld, the Atmos Astra. The Astra does it all, dry herbs, concentrates and even e-juice, all in a slim design and easy to carry design. Since the Astra has no coils to speak of, the ceramic heating chamber will give you a consistent temperature and therefore provide a true vaporization experience without combustion each and every time. 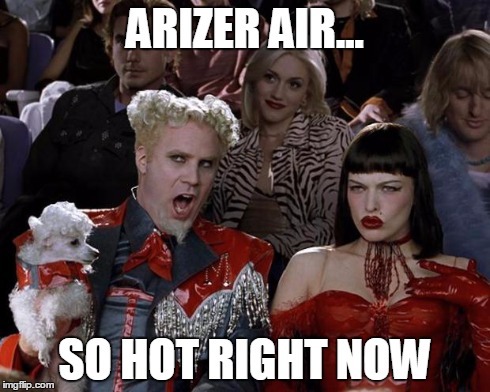 Oh Arizer, will you ever slow down? As if the Extreme Q and Solo didn’t dominate enough as it is Arizer was like “Hey. HEY! Check this out…” and here we are, with one of their best yet, the Arizer Air. The Air gives you desktop quality vapor all in a package even smaller than the Arizer Solo. Beloved features from the Solo make their way onto the Air, such as the all glass vapor path, extremely long battery life, and insanely easy clean up process. All these features are now made more portable than ever with the Air. So if the Irish luck doesn’t carry over from March and bless you with a free vape don’t you worry. All month long we have a plethora of coupons so you can save some big money on whatever your little heart desires. Think we’re done? You must be new here. It’s OK, we’ll forgive you. Head over to our Facebook page where every week day we are giving out a different delicious flavor of e-juice to one random winner. While you’re feeling social, go ahead and add us on Instagram, Pinterest, Google+ and Twitter. This is the fastest way to get instant updates from us, and believe me you’ll need them for how insane April is going to be leading up to 420! So there you have it. As if the birth of spring and the lead up to 420 wasn’t enough. I know I said I’d hate to choose between these vapes, but if you had to which would it be? Let us know in the comments! Thank you! My favorite is the Atmos Astra.